In order to celebrate the 137th birth anniversary of P G Wodehouse, the Pittsburgh Millionaires decided to meet up on the 14th of October, 2018. The meeting took place at one of the Panera Cafés in the Oakland area of Pittsburgh, USA. Lest some of you get an impression that the millionaires foregathered to discuss some trustworthy sources from where one could secure either a cow creamer or a scarab, you would be sadly mistaken. If your ambitions lead you to believe that you could have run into an arts dealer offering The Girl in Blue, the famous Gainsborough miniature, to one of the millionaires present at the gathering, you would be even more off the mark. Had you been able to make it to the gig, you would have discovered the Pittsburgh Millionaires to be a group of strong and adventurous folks, well endowed and successful in more ways than one. Besides being successful at keeping their respective bodies and souls together, they possess an immense wealth which could make many of us green with envy. Their wealth is not to be measured in terms of the millions of dollars they possess, but in terms of the trillions of units of common love and fondness they have for the verbal musician of our times, P G Wodehouse. A profound knowledge of his canon is another wealth they possess. Eve Halliday and Phyllis Jackson were already seated on the table when Rupert Psmith and the not-so-efficient Baxter trooped in. Stiffy Byng fluttered in like a rose-leaf on the wind. Pauline Stoker floated in pretty soon thereafter and the meeting was called to order. 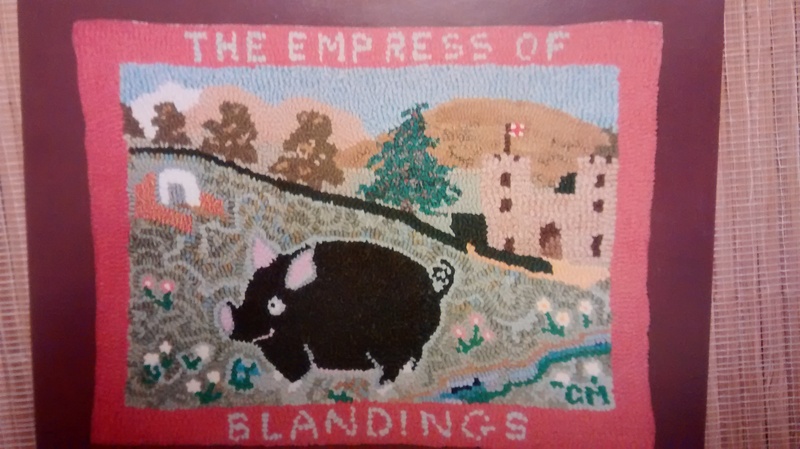 Picture post cards featuring The Empress of Blandings were gifted by Eve Halliday to those present. The management of the Panera Café has a stiff-upper-lip policy. Target practice by throwing bread crumbs is out of the question. The place does not boast of fans of any kind, ceiling or otherwise. Hence, hurling boiled eggs at such contraptions is also ruled out. The ambience of the place is not such as to allow a boisterous rendering of The Sonny Boy. Wisdom prevailed. A reading of the story ‘Goodbye to All Cats’ followed. Curious customers on nearby tables were taken aback by the intermittent ripples of mirth emanating from the table. The management was polite enough not to interrupt but ensured that the tray-carrying trolleys generated sound-bytes which were loud enough to deliver suitable admonitions to the members of the Plummy troupe. Needless to say, the same were duly ignored. Bits and pieces of the Wodehouse canon were fondly recalled by those present. The Bertie-Jeeves relationship was dissected at length. The challenge of popularising his works amongst the youth of today was discussed. Eve Halliday recommended the practice of ‘fairy books’ where some of his works, duly gift wrapped, could be left in public places, spreading joy amongst those who venture to pick these up. Stiffy Byng commented that her interests included not only the narratives dished out by Wodehouse but also the ones whipped up by Alfred Hitchcock. Pauline Stoker lovingly mentioned the BBC series. Deferring to the wishes of the café management, no cake was cut on the occasion. The meeting ended on a cordial note, with much ‘What-ho’-ing and ‘Pip-pip’-ing. Baxter was wished a happy travel back to India. (Note: Yours truly is grateful to Abigail Thompson, Filomena Conti, Allison Thompson, Carol Colby and Sandip Chaudhury, who could spare the time to grace the occasion. Special thanks are due to Allison Thompson who took special interest in coordinating the gathering and even brought along an Augustus look-alike to attract the attention of incoming millionaires). What a fun time you had hanging out with the Pittsburgh chapter of the Wodehouse Society. For those of your readers who don’t know the society has, at last count, 27 chapters spread all over the US and Canada. Organising and expanding are American gifts. Pip,pip.